Plone 3.0.5 is out, finally ! I was waiting for this release for it to solve a bug with archetypes where when I used argouml to generate a plone type, it's required fields did not work correctly. Well, I tested the release out on my lappie and now it works like a charm. Damn this is sweet ! 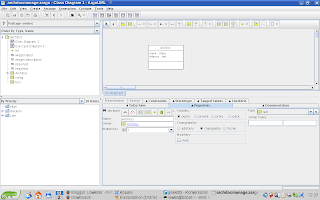 For the uninitiated few who have been living under a big tempurung for like a year, archgenxml is product for plone which generates plone products from your uml diagrams. So what this means to you o' tired developer is, YOU DON'T HAVE TO TOUCH ONE LINE OF CODE to have a working plone product at your disposal.... YES ! Don't adjust your browser text size, you read me right the first time. YOU DO NOT HAVE TO EVEN TOUCH ONE LINE OF CODE. Just design your application using something like argouml, feed it to argenxml and BOOM BAM in as long as it takes for you to restart your plone instance, you have your product sitting there waiting for you. Take your first step on your journey here and start taking on as many plone projects as you can ... woohoo !! Damn this product is so good it should not be free !